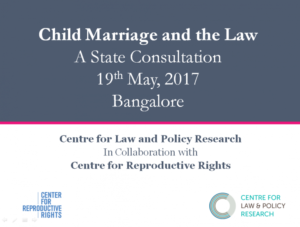 In collaboration with the Centre for Reproductive Rights, Centre for Law and Policy Research organized a Consultation on Child Marriage and the Law on 19th May 2017. The workshop aimed at creating a discourse and urgent dialogue on child marriage and the legal issues surrounding it. The Consultation was divided into three panels through the course of the day. Panel I sought to understand the rationale and functioning of the Prohibition of Child Marriage Act, 2006 (“PCMA”) and looked into questions of void/voidability of marriages, the incongruous nature of child marriage prevention law and personal law, as well as conflicting aspects of the law vis-a-vis the Indian Penal Code. Watch snippets of the Panel which consisted of Dr. Jaya Sagade, Ms. Jayna Kothari and Dr. Kalpana Kannibiran. Panel II dived into the challenges that are faced in seeking to implement the existing law. Ms. Brototi Dutta, Mr. Vasudev Sharma, and Ms. Anuradha Vidyasankar looked at the aspects involved in annulling child marriages, the necessity for compulsory registration of marriages, and the hindrances involved in the filing of complaints as well as stopping of child marriages by the CMPOs and other state authorities. In a conclusion to the session, Panel III consisting of Mr. Rajiv Gowda, Deputy Secretary, Karnataka State Legal Services Authority and Mr. B. S. Rishikesh from Azim Premji University focussed on some of the strategies for the future. The discussion revolved around facilitating access to justice for the victims and using the Right to Education Act as a strategy to address child marriages. This Consultation is a part of an ongoing study and research by CLPR on the implementation of the PCMA. CLPR is working on a legal and policy brief on the same.